Do you have ideas or concerns you'd like to share with ACNM? Contact Kira Schultz RN, MSN, BS student representative to the ACNM Board of Directors. Would you like to be more directly involved in addressing student issues with the ACNM? Become a liaison from your school to the Student and New Midwives Committee (SANMC) of the ACNM Division of Education. Contact Co-Chairs Heather Hines, CNM DNP or Yuliya Labko, MSN, CNM about representing your education program as one of the SANMC liaisons. Are you interested in learning more about how a student becomes a representative to the ACNM Board of Directors? Learn more about the SANMC and BOD positions. To date, here are the students who have served. Collecting information on student priorities and concerns and communicating these issues to ACNM in the form of the annual Student Report that is presented at each Annual Meeting. on-boarding of the new cohort. The purpose of the student report is to provide student members of ACNM with an opportunity to address the ACNM BOD, ACNM staff, ACNM leadership and the general membership about the issues/concerns that they would like to see addressed by the College and to share their vision of how these issues/concerns might be addressed. Each year during the months leading up to the ACNM Annual Meeting, student liaisons (one from each education program) collect information from their classmates about content to include and begin drafting the report. The final report is written by the liaisons during face-to-face meetings at the Annual Meeting and delivered to the membership by selected liaisons during the closing business meeting. Following the Annual Meeting, the ACNM Board of Directors carefully reviews the report to determine the need for potential action to be taken by various ACNM volunteer divisions or national office departments in order to address points that were raised by students. 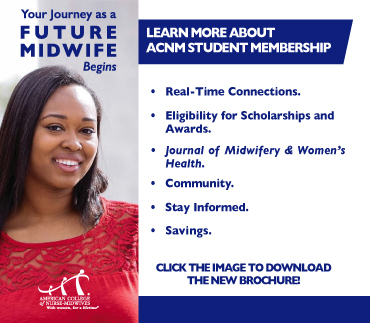 Join ACNM on Facebook, Twitter, YouTube, and the ACNM blog Midwife Connection. We also have a Facebook group just for students called ACNM Student Midwives. Financial Aid?Initial leads and resources to help finance your midwifery education. Prepare for your Certification? ACNM wants to help you succeed in becoming a certified nurse-midwife or certified midwife. There are several ways to study for your American Midwifery Certification Board (AMCB) certification exam. Knowing that everyone has different learning styles and preferences, we are proud to offer the following options to choose from! Midwifery & Women's Health Nurse Practitioner Certification Review Guide, Fourth Edition is a comprehensive review designed to help midwives and women's health nurse practitioners prepare for their certification exams. Based on the American Midwifery Certification Board (AMCB) and the National Certification Corporation (NCC) test blueprints, it contains nearly 1,000 questions with answers and rationales representing those found on the exams. Midwifery & Women's Health Nurse Practitioner Certification Review Guide, Fourth Edition is published in partnership with the American College of Nurse-Midwives (ACNM) and endorsed by the National Association of Nurse Practitioners in Women's Health (NPWH). Attend the ACNM LIVE Exam Prep Workshop at the annual meeting each year. In this two-day interactive workshop, midwifery professors review key information and case studies with students from across the country. We hope you find these resources helpful in your graduate studies. Are you nearing graduation? Check out our resources for new midwives (members only) which will help you to transition from student to practicing midwife!